The main goal of the study is the rationalisation of the accessibility to Cagliari along Viale Marconi, through a one-way system configuration supported by two public transport dedicated lanes, together with the reconfiguration of the intersection of Via Berlino with a roundabout and the adjustment of the access link to the Asse Mediano from Via Berlino and Via Dei Conversi. Systematica was appointed to support designers and companies in drafting the project proposal phase with the verification of the functionality of the entire intervention, both during construction and operation. 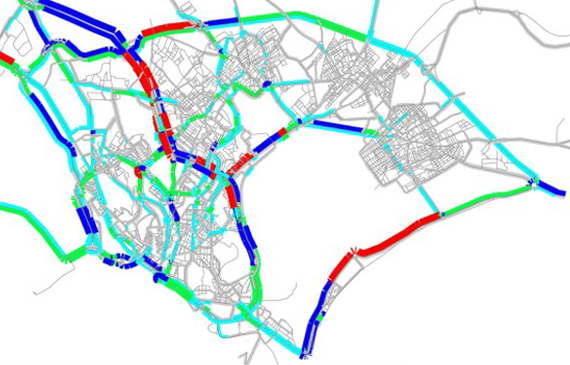 To this end, the traffic model at territorial scale (Cagliari’s wide area implemented in Cube, Citilabs) was used, supported by a specific traffic survey aimed at updating and calibrating the modeling tool. A simplified cost-benefit analysis was also carried out (cost-effectiveness), through the estimation of the vehicle operating costs, generalized costs (value of time) and costs due to pollution and noise. Macro-simulation is carried out to support designers for the reconfiguration road proposal, and to to verify the effectiveness of the entire intervention.